Fiona Byarugaba, is Program Management and Communications Officer at Grameen Foundation’s AppLab Uganda office, and MTN/Grameen Foundation Relationship Manager. We have included a excerpt of her blog post followed by a link to the full post. Samson Sabiiti Olet’s goat was suffering from a disease unknown to him. In a state of panic, Samson met his village Community Knowledge Worker, or CKW, telling him that the goat’s body was covered in “white dots.” After the CKW looked at the goat, he opened his phone, and within seven minutes had discovered that Samson’s goat was affected by ticks. Once Samson – a farmer from Oyam district, Adagayella village – started following the CKW’s advice about how to treat the goat for ticks, all was well, and the goat has gotten its healthy appetite back again. The journey of a thousand miles begins with a single footstep. Grameen Foundation helps the world’s poorest people to take those footsteps and lift themselves out of poverty by providing mobile phone-based solutions that address “information poverty” in the fields of agriculture, financial services, health and livelihoods. Shannon Maynard is Director of Bankers without Borders® (BwB), Grameen Foundation’s skilled-volunteer initiative. Maynard has more than 15 years of experience in nonprofit management and volunteer mobilization. Before joining Grameen Foundation, she served as Executive Director of the President’s Council on Service and Civic Participation, and managed strategic initiatives for the Corporation for National and Community Service, a federal agency. This post is the third in a four-part series; you can read her first post here, and her second post here. “Things move more slowly in Africa” – this is a common refrain for many of us at Grameen Foundation when we find ourselves experiencing hurdles with our work in places like Nigeria and Ethiopia. In fact, African countries and the organizations we work with do often lack the infrastructure – particularly the Internet connectivity – that contributes to the fast-paced, rapid-response world that those of us based in the United States have grown so accustomed to. Slower is also a word I’d use to describe Bankers without Borders’ own presence in Sub-Saharan Africa. Joining Grameen Foundation after primarily working with US-based NGOs, I remember my own first experiences arranging a call with a microfinance institution (MFI) leader in Sub-Saharan Africa – fumbling around with Skype to enter the correct phone number, then getting a voicemail message in a language I couldn’t understand. It might take a few weeks of trying to connect at a time convenient for us both. In those early days, Grameen Foundation did not have local offices or staff in places like Nairobi, Accra or Kampala. Cultivating relationships and managing projects is difficult to do from a different continent, which is why I am amazed we were actually able to do any work in places like Ghana and Nigeria in those first few years of BwB. Over the past year, however, BwB has been able to gain some traction in the region, thanks to the regional leadership of Erin Conner and Steve Wardle, and BwB Regional Program Officer Martin Gitari, all based in Nairobi. 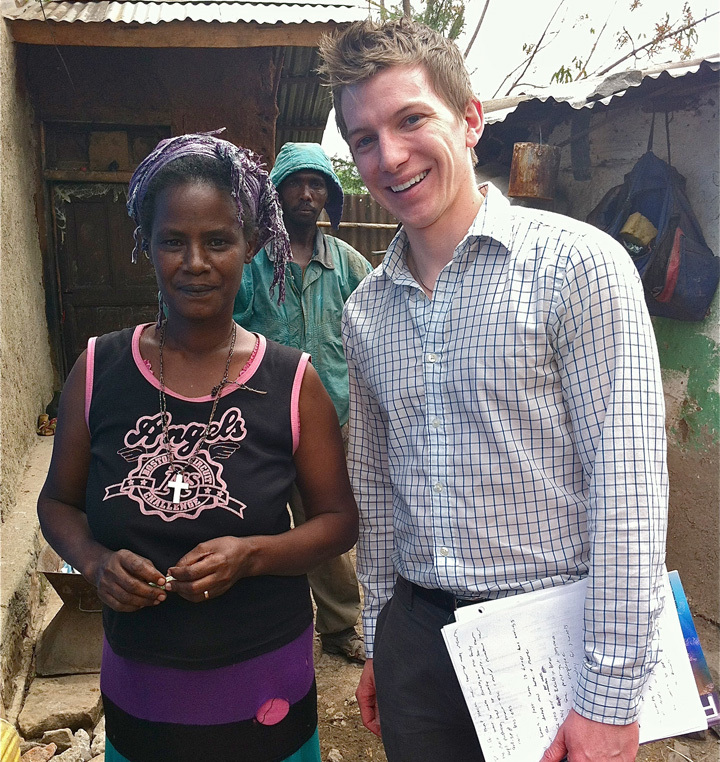 David Washer (right) spent a week meeting clients and lending his skills in finance to Eshet, an Ethiopian microfinance institution, as part of BwB’s Financial Modeling Reserve Corps. Grameen Foundation’s own programs, particularly our MOTECH work in Ghana and Community Knowledge Worker (CKW) program in Uganda, are BwB’s biggest clients. In our early days, we had a hard time convincing Grameen Foundation’s own technology teams of the services we could provide, because Grameen Foundation’s own employees assumed BwB was only focused on connecting bankers with microfinance institutions (a fair assumption, given our name). Thanks to some education on our part and the willingness of these programs’ leaders to give us a try, we’ve been able to place volunteers such as Chris Smith and Gillian Evans (a husband-and-wife team) with CKW and Roche employee Lynda Barton with MOTECH, in year-long placements. We’ve worked with CKW to establish a local collaboration with Makere University to provide interns to our Uganda office each semester. And we’ve just finalized arrangements to engage a Glaxo Smith Kline employee with the CKW team on a six-month assignment, starting this month. Benson Okech is an accountant at Grameen Foundation’s Applab Uganda office. This post appeared on the Applab blog and is excerpted with a link to the full post below. When one is traveling to the Rwenzori area, what rings in the mind of the individual are the cascading waterfalls from the peak of Mt. Rwenzori and the presence of several species of wild animals in the national parks in western Uganda. There also are other breaking stories about this area, including a group of poor farmers who are helping others like themselves improve their livelihoods by expanding access to accurate, timely information. (left to right) Peace, from Ernst & Young; Ibrahim, a local farmer; Benson, a Grameen Foundation accountant; and Jacob, the local CKW. Zangura Ibrahim has been a subsistence farmer for several years in his little-known village of Kanyampara 1, Kacungiro Parish, Munkunyu Sub County, in Kasese District. His passion for agriculture was boosted when he learnt of people in his area called Community Knowledge Workers, or CKWs, who are recruited and trained by Grameen Foundation to serve farmers like him within the area. 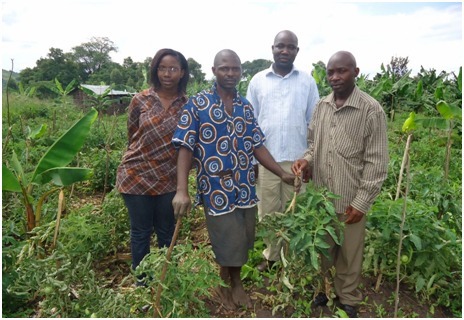 Before Ibrahim knew there was a CKW in his area, his two-acre farm was planted with matooke and tomatoes for domestic consumption. 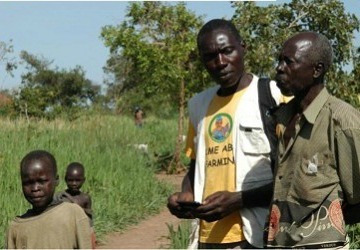 However, with the help of Wanzalha Jacob, his local CKW, Ibrahim diversified his crops. He now also grows beans and potatoes, and uses the increased income he earns by selling them for necessities like sugar, salt and medicine. Chris Smith and Gillian Evans are a husband-and-wife team volunteering in Uganda with Grameen Foundation through our Bankers without Borders® volunteer initiative. As Strategy Manager, Chris is responsible for business planning and Grameen Foundation’s relationship with MTN Uganda. Gillian is an Education Specialist, responsible for developing and applying training best practices in the field and helping build the training center of excellence in Uganda. Chris and Gillian live in Kampala with their two children and will complete their one-year volunteer term on July 31. You can read about their experience as a family living and working for Grameen Foundation in Uganda on their blog at www.smithsinuganda.com. It doesn’t matter where you live – people love to talk about the weather. You may think that citizens of a country like Uganda, which comfortably straddles the equator and where people are generally unfamiliar with terms like “zero visibility” and “whiteout conditions,” would not be fussed whether it is 25 or 28 degrees Celsius on any given day of the year. However, as we’ve found out, there is an unmet need for accurate and advanced forecasting of daily and seasonal weather, and extreme weather alerts. It’s taken me the better part of 10 months to figure out that when you wake up, look out the window and see sunny, crystal-clear blue skies that this is a sure sign it will rain the rest of the day. If it starts off raining then it’s most likely going to be a beautiful day. I used to leave the house in the morning and ask Omara (our gardener, and a highly accurate weather forecaster) what the weather would be like. He would scan the clear blue horizon, think for a moment and forecast rain. And he was almost always right. No amount of searching the skies or wind direction would give me any indicator other than the obvious lack of clouds. The Daily Monitor, a newspaper in Kampala, has an interesting — and inconsistent — way of showing its predictions of the Ugandan weather. Why does “Today” have a thunderstorm graphic and a text description of “Day partly cloudy and night clear,” yet Friday is the only graphic that looks like cloudy and no rain, yet says “Thunderstorms in the day, clear at night” – but then that exact same text description is used with the thunderstorm graphic for Saturday? Aaaaaaaaaaaaaah … I don’t understand!